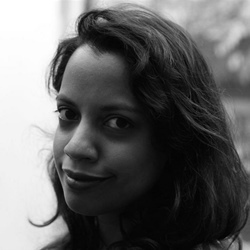 Shehani Fernando is a multimedia journalist and filmmaker who has worked for The Guardian, BBC, Al Jazeera and a number of independent production companies. Hartnett, who is a longstanding friend of Northcote, is today accompanied by her dog Alfie (a Jack Russell who is determined to steal the show). Her dishes tonight are her trademarked Italian-inspired fare. Lines of beautiful fresh agnolotti are being made in the kitchen for her starter - always a pleasure to watch. When it comes out in the evening, the little pheasant parcels have a shaving of black truffle and sit in a rich, earthy jus of pheasant and rosemary. It's a warming starter of staunchly Italian roots. It is Margot Janse's first time at Northcote and indeed "so far North in England" she tells me. Janse emigrated from Holland to South Africa over 25 years ago and worked as a photographer, witnessing Mandela's release at the end of apartheid, and assisting the famous photojournalist David Goldblatt. Her time was spent knee deep in a darkroom shooting black and white pictures, but ultimately she decided food was her passion and since there were no cooking courses available, she asked Johannesburg restaurateur Ciro Molinaro for a job in the kitchen. She's been at the award winning Le Quartier Francais (part of the Relais and Chateaux group) since 1995, overseeing The Tasting Room restaurant where her focus is on local ingredients, such as spekboom and baobab, that are less common to a Western audience. Janse's fish starter arrives under the cover of a beautiful piece of homemade sorrel nori, looking like something that has been freshly unearthed from the sea. 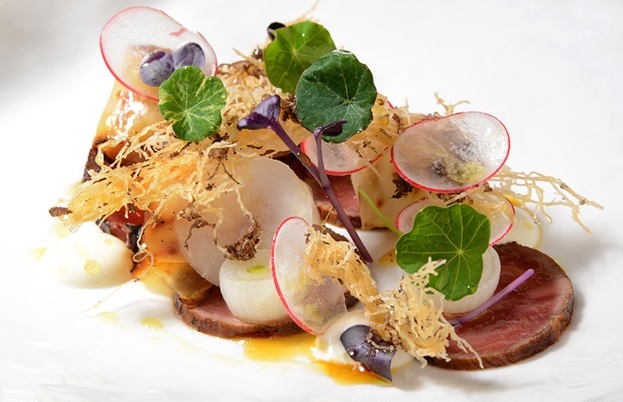 A delicate consommé of cucumber and horseradish is poured at the table, melting the nori slightly and revealing what lies under: thin slices of smoked eel accompanied with a savoury custard and squid ink, accompanied by a salad of daikon, radish shoots and crispy quinoa. The overall effect is clean and light, but bursting with texture and little surprises. 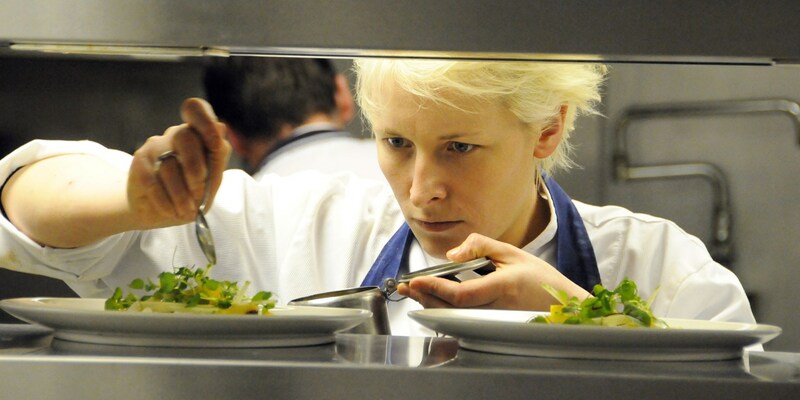 Next up is Northcote's own Lisa Allen who has been heading up the kitchen for 10 years since she was 23. Tonight is a brief welcome home for her, since technically she is on maternity leave, having given birth seven weeks ago! We get a quick glimpse of Teddy-Ray but Lisa doesn't seem phased at all and as we film her in the kitchen, it's like she's never been away. 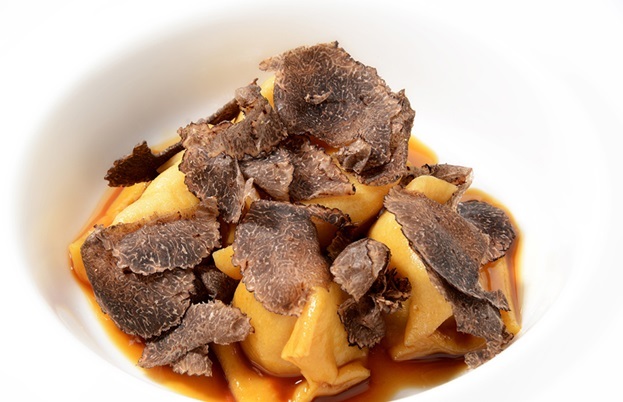 Lisa’s course is a caramelised venison carpaccio accompanied by thin slices of salt-baked celeriac, a sweet and sour dressing with pineapple undertones, and a little bit of truffle and foie gras on delicate katafi pastry. The fish course is Hartnett's and arrives with no frills or fuss - an opaque piece of perfect cod under a buttery crust of breadcrumbs sitting on a beautifully-judged purée of butternut squash with a hint of orange. Texture is added with a sprinkling of deep fried garlic kale and a crunchy pine nut and Parmesan pesto. Janse's meat course plays with some of the ideas associated with an African ‘bush brai’ (a BBQ) and the concept of biltong (dried and cured meat using a combination of spices). 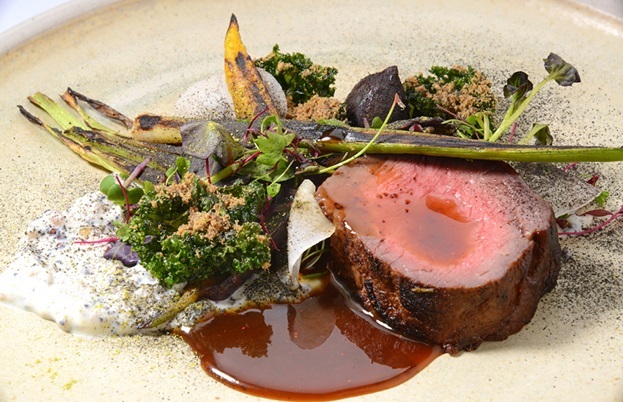 A pink slice of beer fed Dexter beef is cured with biltong powder accompanied with baby vegetables, labne, deep fried kale and a jus of sour fig; (another indigenous ingredient - its seeds pop in the mouth a bit like passion fruit). All of this was sprinkled with burnt potato powder and Buchu (a South Africa herb that tastes of blackcurrant). For me, this was the standout dish of the night. And finally it's time for dessert from Allen. "I was craving Toffee Crisps when I was pregnant so I started to think about how I could turn that into a dessert". Allen's food likes to trigger memories she tells me, and indeed this rich portion of chocolate goodness does the trick. The sophisticated chocolate brûlée sat on a bed of popped wild rice. A molten centre of liquid salted caramel was offset by the scoop of blood orange and kumquat sorbet. Rather than the cloying Toffee Crisps of olde, this is a balanced dessert for chocolate-lovers. Northcote’s choice of chefs at Obsession are always carefully thought out for wow factor and that night was no exception. 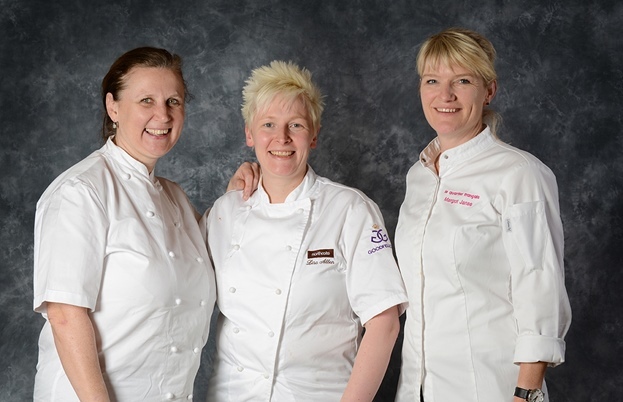 These are three chefs at the top of their game and the night, as always, has been memorable.